Which course type (seated, online, or hybrid) is for you? Lake Sumter offers a variety of ways for students to take classes. If you want the classic college experience, you can sign up for a fully seated class. On the other hand, if you're looking for something a little more flexible, you can register for an online class or mix the two and take a hybrid course. But what course type gives the most bang for your buck? -Which class type do you prefer? -In which class type do you learn the most? -Which class type is the easiest? 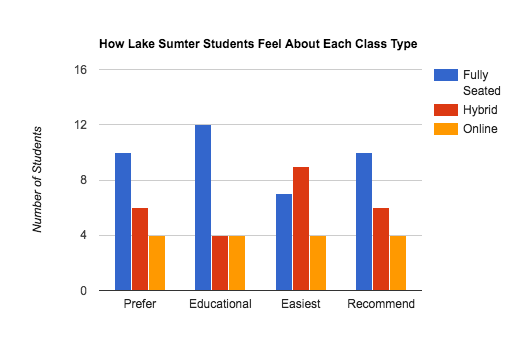 -Which class type would you recommend to new students? Most students enjoy the traditional fully seated classes, while the online format was the least popular across the board. Perhaps this can be explained by student responses to the second question - the one where we find the biggest discrepancy. 60% felt they learned better with the fully seated option. 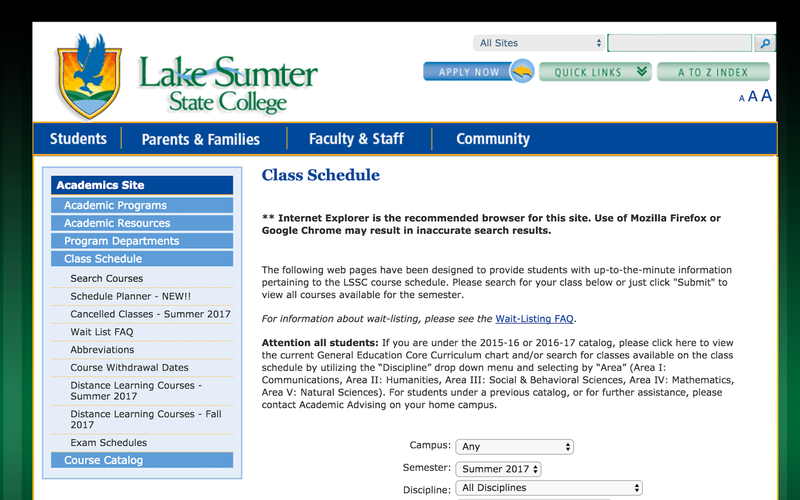 So what's wrong with online classes? Why do students favor the fully seated and hybrid format over online? Students like Dominic Camerino and Victor Grubman gave some insight. Dominic said, "Online is hard to stay on task at times." Victor claimed, "Online classes lacked guidance." Others felt differently. Andrew Raghunandan, who prefers the hybrid and online style, poses the question, "What's the point of going to class 2-3 times a week if the work is going to be online the majority of the time?" Success in any course type seems to depend on the student. If you're more of an independently motivated person, online classes might be best for you. However, if you learn more from others, the fully seated format is your best bet. Hopefully, this will be a reminder to analyze our learning preferences before signing up for classes, so that we best set ourselves up for success.